Floral stamping is what got me hooked up on stamping on handmade cards in the first place and it’s kind of been awhile since I last just stamped some simple one layer cards without any tricks or techniques. I’ve missed that and decided to stamp a few super simple cards today. I picked So Loved stamp set by Simon Says Stamp for my cards as this is one of the perfect stamp sets for beginner and experienced stampers alike. 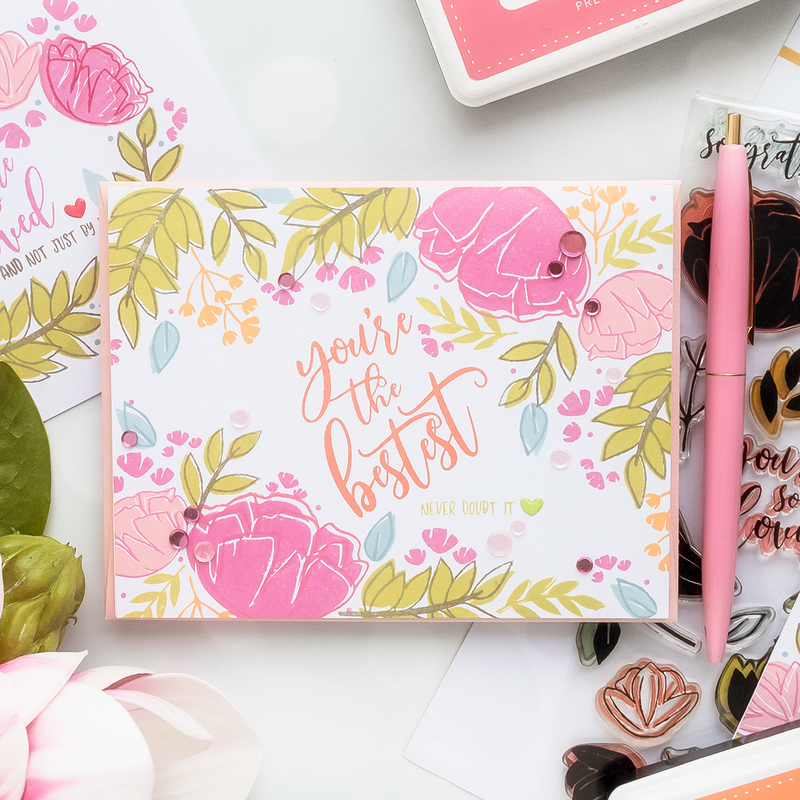 It’s a large 6×8 set with many beautiful big sentiments as well as some bold florals. Most images in here have a solid and an outline layer giving me a whole lot of options when stamping. The colors I used for my cards are the following: Rosie Cheeks, Hollyhock, Rose Apple (later replaced with Watermelon on some cards), Catkin, Cloudy Sky, Seafoam and Sunkist. I decided I was going to go old school and stamp using my clear blocks only and not use my stamp platform. Why? Well, because when you use a stamp platform while you do get better results, there’s no doubt there, you also get slowed down. I didn’t want to spend twice as much time stamping these using a MISTI, I wanted to get things done and I wanted them done quickly. I stamped 4 types of cards/layouts using same images & ink colors. All of these are very similar but also different just a bit. Be sure to watch my video for details and close ups! If you arrived from Cathy Zielske the next stop on this hop is Yoonsun Hur. 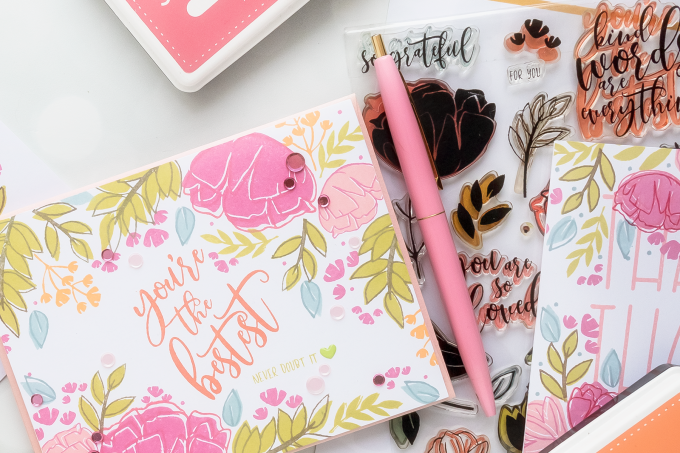 You can also start over on the Simon Says Stamp blog. Simon Says Stamp is giving away a $25 coupon on every stop of the hop. Leave a comment below to enter this giveaway. Winner will be posted on Simon Says Stamp store blog on Wednesday, the 16th of January. 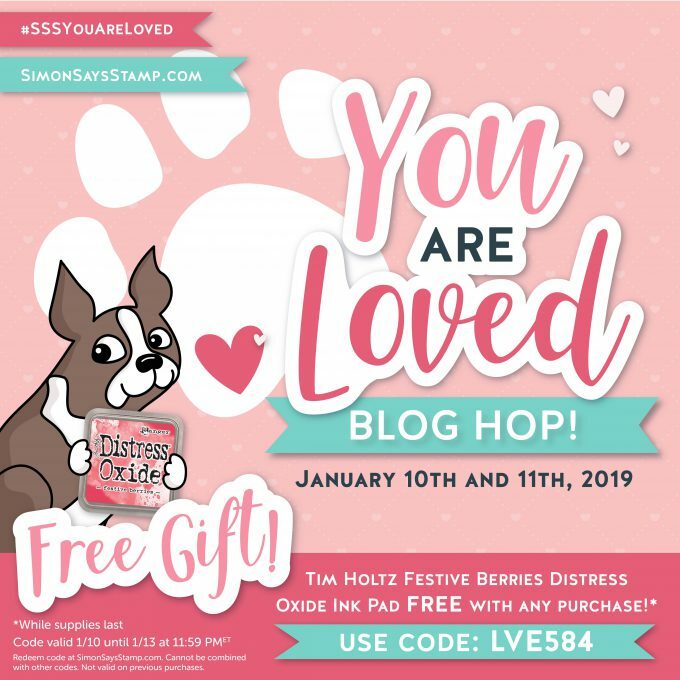 Use code LVE584 when placing an order at Simon Says Stamp to receive a free Tim Holtz Festive Berries Distress Oxide Ink Pad (while supplies last!) with any purchase. The code will expire Sunday, 1/13 at 11:59 pm EST. 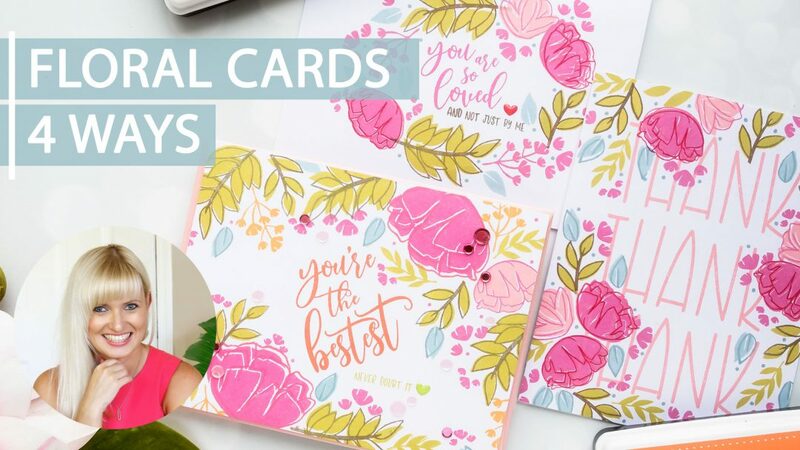 Beautiful cards – they are very feminine and flirty – love the matching inking on the sentiments. Those are such pretty colours! You’ve inspired me to get out my floral stamps and see what I can create. Thanks for sharing these lovely cards, Yana. Having a variety of ways to work with a basic floral set is always appreciated. Your cards are so lovely. All 4 cards are lovely, as well as the floral pattern card you posted earlier in the week. I love your color choices. love love LOVE the colors! 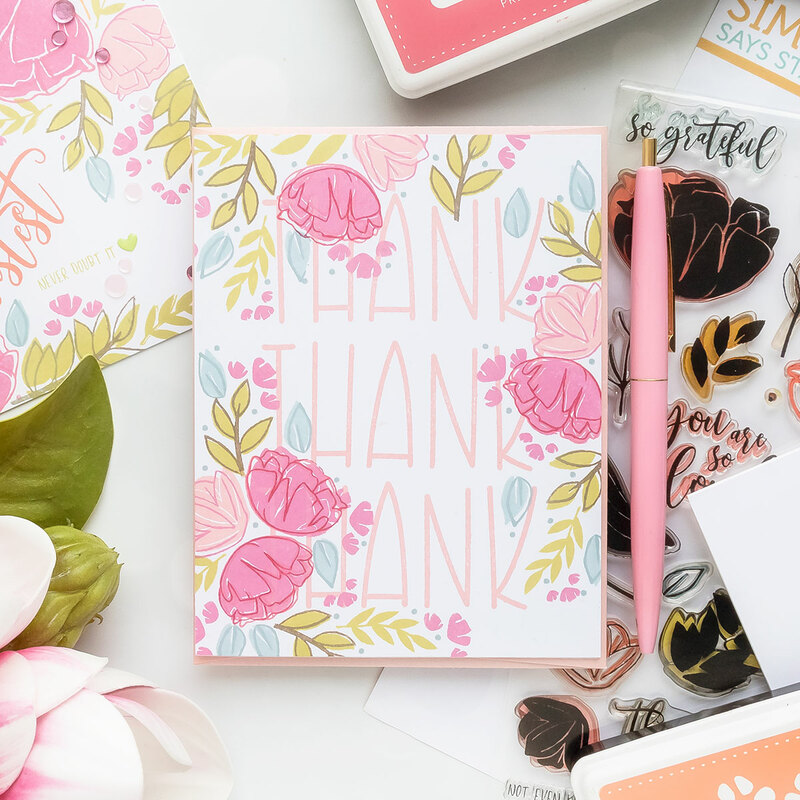 Pretty designs and color combo! Yana, your flower cards are beautiful. I love the colors you used! All beautiful, but my favorite is the small wreath card! I love the pretty fresh colours you’ve used for your cards! Great cards Yana, love that you showed how to make with one stamp different cards. Thank you so much and have a great weekend. Nice cards, love the colors. Love the ways to make different cards with a stamp, very helpful for beginners like me. Love the soft colors. WOW what pretty cards you have created Yana, makes me wish for the summer!! Wonderful colors and great designs! Gorgeous cards as usual! Love your creativity! Thanks for all of the inspiration. Love your cards Yana! I look forward to your videos, your voice and accent is captivating!! Always on the lookout for different ways to create thank you cards! Thanks for sharing!! Great colors & super pretty card! 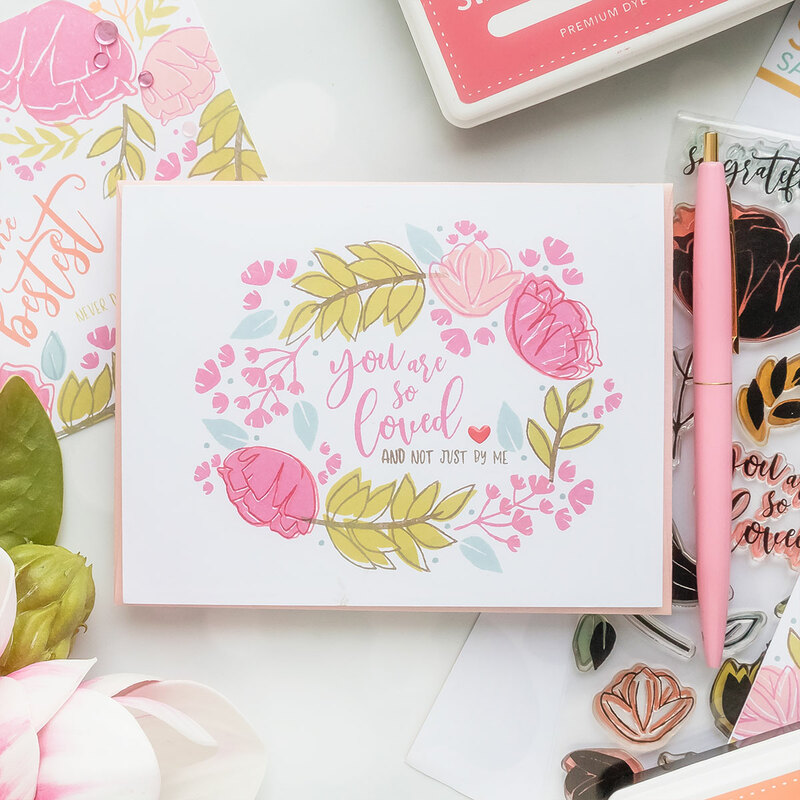 Love your cards and your color choices! The big “thank” stamp is awesome as well. Love all the pastels & pink hues! Love the pastels & pink hues! Love the colors, bright and cheerful. Also like the no fussy and quick stamping that sure looks like a million! You work so quickly and the results are always gorgeous! Oh my! What beautiful cards! They are so bright and cheerful! I love your card! Such lovely colors! These cards are beautiful. I love the colors – so cheerful. Those are great group cards so that you could give as a present, all slightly different but but the same. Thanks for the great suggestions in relations to thinking about these cards. Such beautiful cards and the perfect colors to be used together!!! Creative cards and makes me want to get this set! Thank you! Wow the colors look so happy! Sometimes I forget what you can do in one layer, thanks for the inspiration! 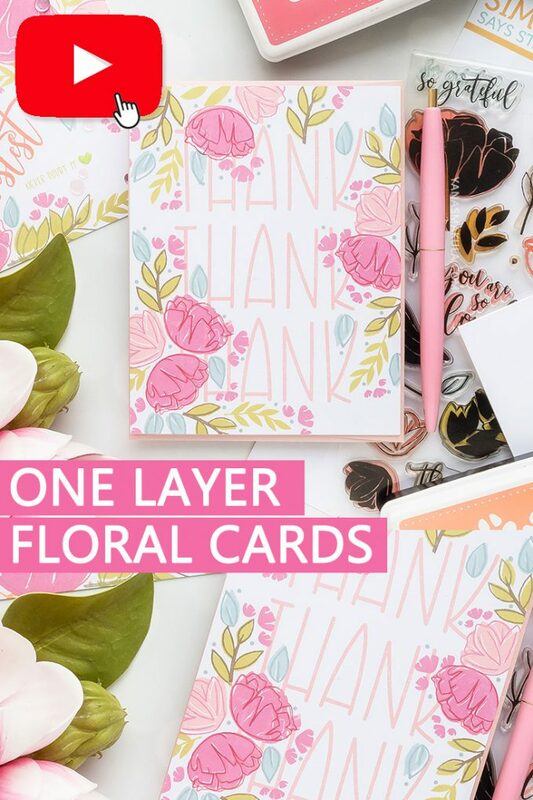 Very pretty soft colors you used on these cards Yana. They are just gorgeous! Thanks for sharing with us. Beautiful set of cards, Yana! I love the pretty pastel colors and the matching sentiments. I sort of overlooked this set in favor of the heart items, but I like how the simple layering creates such beautiful flowers.